Bolero, by that remarkable duo Meryl Tankard and Régis Lansac, will have another European outing in April 2012. It will appear on a triple bill program by the Lyon Opera Ballet along with works by William Forsythe and Jiri Kylian. Is there any other Australian choreographer whose work can, over and over again, stand alongside those who are considered by most to be choreographic giants? Bolero shows off Tankard’s capacity to create a vision of an ever-changing body in movement. 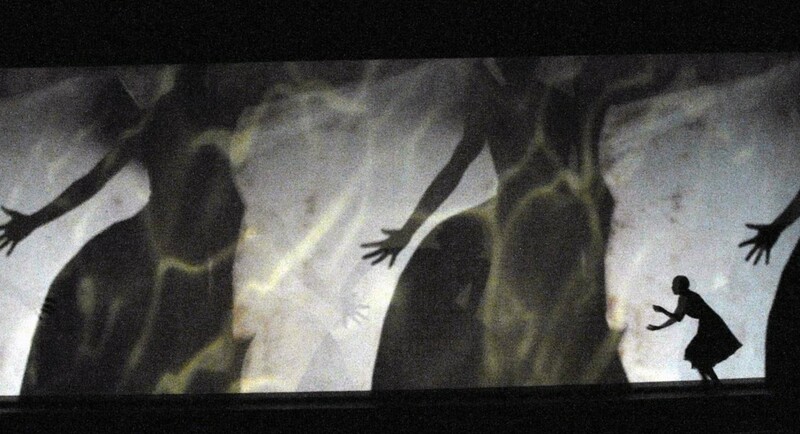 It grows from earlier experiments with shadow play, which can be traced at least back to works made in Canberra—works such as Banshee and Nuti. Bolero was first staged on commission from the Lyon Opera Ballet in 1998 shortly after Tankard had been dismissed as artistic director of Australian Dance Theatre. Its opening scene recalls a Javanese shadow play. Shadows in profile, delicately costumed in bell-shaped skirts with fretted designs are images of real dancers who are hidden behind a screen. As these dancers move across the stage space, they hold their arms in a way that casts two dimensional shapes onto the screen. They move jerkily through images of shadowy columns and disappear behind what appears to be the narrowest of slits between two architectural columns. They then re-emerge from this slim, vertical strip of light, and pursue their crossing of the space. However, as the work proceeds—and it is performed entirely as a shadow play—the feeling of artificiality disappears. A feeling that this is a real world emerges, even though the audience is still involved in watching bodies behaving in mysterious ways. At one stage a man and a woman engage in a romantic interlude that changes emotional direction and ends with her being pushed to the ground. As she falls to the ground the floor swallows her up. The shadow of her body simply disappears from view. Further into the piece a Spanish dancer is joined by a headless woman and they dance alongside each other. Set to the driving rhythms of Ravel’s Bolero, the dance gathers momentum along with the music. As both music and dance move to an inevitable climax, shadowy figures change size and shape and position. Some scurry across the space, some move with relentless slowness. There are multiple manifestations of the one figure. Frenzy and control. It is a technical tour de force for Lansac and a work in which the collaboration between Tankard and Lansac reaches a high point. The work was restaged in 2003 in Sweden by the GöteborgsOperans Balett but has never been seen in full in Australia.